At Entebbe International airport you will meet our company representative to transfer you to your Hotel for check in. Depending on the time of arrival you will go for a city tour to check out places like, the Uganda museum, Kasubi Tombs, Namugongo Uganda Martyrs shrine and the Bahai temple. Dinner and a night at your hotel of choice. Drive to Lake Mburo to go for a game drive along the lake shore track, through the Kigambara Loop that offers interesting guided lakeside walks. You will see animals like topis, elands, zebras and buffaloes. You will have lunch to go for a boat ride on Lake Mburo to view birds Papyrus Gonolek, Carruther’s Cisticolas, Brown-faced Lapwings, the extraordinary White winged Warbler, and Bare-Faced Go-away bird. Dinner and overnight at Mihingo lodge, Mantana Luxury Tented Camp, Rwanyo Camp. Day 3: Bwindi Impenetrable forest. Have your breakfast and then drive west to Bwindi Park through Maramagambo and Ishasha following the mystical Rwenzori Mountains for most of the journey. Look out for game enroute through the Ishasha sector expect to see animals like buffaloes, antelopes, elephants, Uganda Kobs and many more. You will reach in the late afternoon to have a rest around the Forest to explore the services hotel / lodge has to offer overnight and dinner at; Gorilla Forest Camp / Buhoma Lodge / Gorilla Resort. This morning you will leave for the park headquarters to have a briefing before embark on Gorilla tracking. 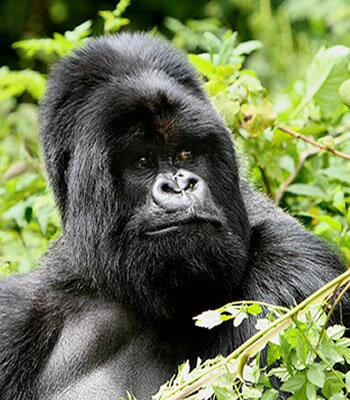 Bwindi is a stunning forest that offers dramatic, heavily forested and dense landscape crossed by numerous animal trails, allowing access for tourists. While tracking gorillas in Bwindi, look out for animals like the rare golden monkeys, buffaloes, leopards, elephants, bushbucks, black-fronted duikers, and giant forest hogs. The gorilla trekking activity is strenuous but observing and spending time with the mountain gorillas is an unusual and inspiring adventure. They are shy and peaceful- an experience that is unforgettable. 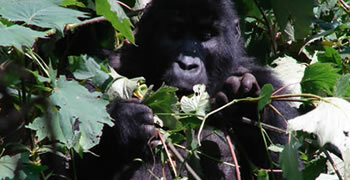 Dinner and overnight at Gorilla Resort, Engagi Lodge, Buhoma Rest camp or Buhoma community Bandas. Have breakfast to proceed to Rwanda via Kisoro and cross the Border to Ruhengeri; Dinner and overnight at Virunga Volcanic Lodge/ Sabinyo Lodge, Gorilla Nest / Gorilla View lodge / Baubau Lodge. Early morning after your breakfast proceed to Kigali for city of Kigali sightseeing. Visit places in the city including genocide memorial site at Gisozi. This is a big place and it take a lot of time to complete almost to 4 hrs and then a few art and craft shops in the city. Refresh and you will be transferred to Kigali airport to catch your flight.